myHEALTHware Fax users can now create customizable tags. 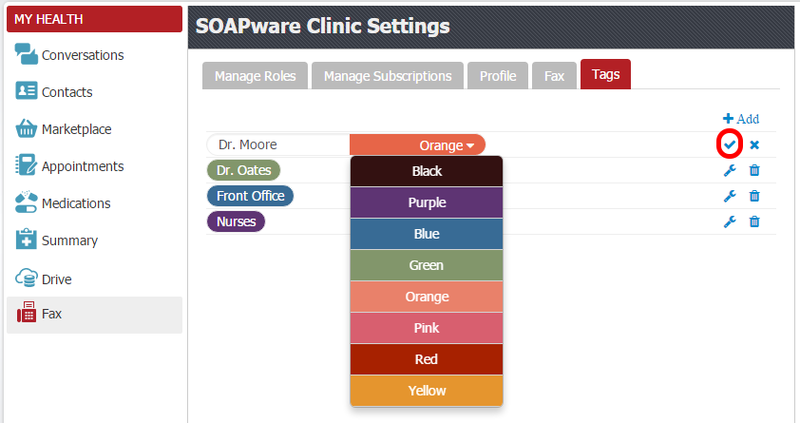 This feature allows the clinic to route faxes to appropriate staff within the office or to prioritize faxes based upon customizable tags that can be created by the clinic administrator. Create tags for each staff member (or role in the clinic). Users can then tag faxes by the staff/role that needs to complete a task on the incoming fax. Create tags for priority of faxes (ie: High, Normal, Low) to assign a severity level to the incoming fax. Create tags for specific providers to route the faxes to a specific provider to indicate that it needs to be reviewed/signed, etc. Create tags for any custom label that fits your office workflow! Log in to myHEALTHware and click the Fax tab. Click the Settings icon next to your clinic name. To create a custom tag, click the +Add button. Enter the desired name for the tag and select a color using the drop-down menu. To save your new tag, click the checkmark icon. Once the custom tags have been created, you can add a tag to a fax. Return to your Fax inbox and click the +Add Tag button, below the fax, to select a custom tag. To filter your Fax Inbox by a tag, click the All Tags drop-down menu and select the tag that you wish to view. Selecting a tag will filter the Inbox view so that you see only faxes that have the selected tag assigned.